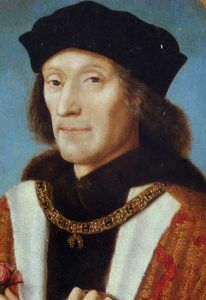 Citation: C N Trueman "Henry VII and Commerce"
For Henry VII, commerce and a strong commercial economy were vital factors in developing royal authority. Henry believed that if his subjects were rich (by their standards) then their support for him would grow even more as his loyal subjects would credit Henry for their increased wealth. Therefore, Henry gave a great deal of his support to developing the country’s commercial base, especially overseas trade. England had lost out to Western Europe during the War of the Roses in terms of commerce. As England was an unreliable market during this troubled time, trade was sent elsewhere to more reliable markets. Henry VII had to do what he could to once again pick up the country’s commercial base. To do this he had to take on the powerful Hanseatic League that dominated trade in Northern Europe. Ships from the Hanseatic League were the primary carriers of English goods abroad – such had been the decline of English merchant shipping. Henry decided that this issue was the first that had to be resolved. Between 1485 and 1486, the Navigation Act was implemented. This act forbade English merchants from loading their goods onto foreign ships if English ships were available. An English merchant ship was described as one that had a crew that was made up of at least 50% Englishmen. In 1489 a law was introduced that stated that only English ships were allowed to be used to import goods and that a foreign ship could only be used when an English ship was not available. Henry was clearly trying to protect the English market – but what he did upset the leaders of the Hanseatic League. However, this reaction could be interpreted as a sign as to the success of Henry’s measures.